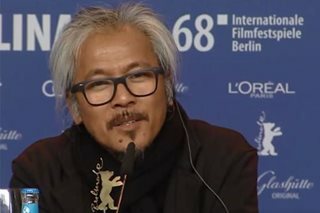 Lav Diaz shot his 4-hour black-and-white film "Ang Panahon ng Halimaw" ("Season of the Devil") to illustrate the Filipinos' seemingly endless struggle against despotic leaders. A "rock opera" that takes place during the martial-law era in the Philippines in the 1970s, "Ang Panahon ng Halimaw" has been described as Diaz's "seething critique" against authoritarianism. It became Diaz's pass to this year's Berlin International Film Festival, wherein he's in the running for the main prize. Speaking before reporters at the festival, Diaz explained that "the Filipinos' struggle is humanity's struggle." "That's why you can relate to our stories as well," he said, before adding that the modern world, in a case of history repeating itself, is again facing an uphill battle against "fascism and barbarism." "It's everywhere, we have the same struggles. Why do we still have guys like Duterte, Trump and all those motherf****rs?" Diaz describes "Ang Panahon ng Halimaw" as a "rock opera." It features 33 of his original compositions, as performed by the likes of Piolo Pascual, Shaina Magdayao and Bituin Escalante. "In the late 1970s, a military-controlled militia is oppressing a remote village in the Philippine jungle. The uniformed men armed with machine guns are responsible for spreading a terror that is both physical and psychological in nature. "They create an atmosphere in which neighbors become enemies and seek to eradicate the villagers’ faith in legends and spirits. Fearless young doctor Lorena opens a clinic for the poor, but disappears without a trace shortly afterwards. "Her husband, the poet, activist and teacher Hugo Haniway, wants to find out the truth of his wife’s whereabouts. When he arrives, he is confronted with a community shattered by despotism and violence."